Long a standard in the industry for a compact programmable power supply, the DLM is now available with Ethernet control. In addition to 10/100base-T compatibility, the new option provides 16-bit control of voltage, current and overvoltage, along with 16-bit readback resulting in improved accuracies over the traditional IEEE-488 version. With the new Ethernet option, the power supply maintains its superior noise performance (see Improved performance), small 1U _ rack size and exceptional reliability. 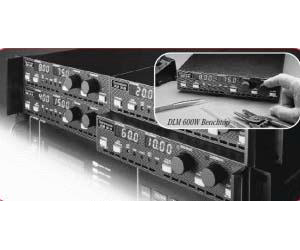 The DLM 600W Series of programmable power supplies is designed to provide continuously variable output voltage and current for a broad range of applications in a compact 1U (1.75 inches) high, half-rack (8.5 inch) wide chassis. With the use of Zero Voltage Switching (ZVS) technology, these supplies are able to achieve exceptionally low ripple and noise rivaling larger and more expensive linear power supplies. In addition, the high efficiency and fast load transient response assure the DLM is ideal for even the most demanding applications. The DLM 600W Models are ideal for high density multiple output rackmount requirements or low profile benchtop applications. Output voltages from 0-5VDC to 0-300VDC and currents from 0-2A to 0-75A are available. The cooling air intake is at the front and sides with exhaust at the rear and sides. Variable speed fans are controlled as a function of ambient air temperature and load, thus reducing acoustic noise and increasing fan life. This allows supplies to be stacked one directly on top of another without space in between, yielding maximum rackmount packing density and a wide operating temperature of 0-50_ C. An optional rackmount kit is available to easily mount one or two units side-by-side. The front panel layout makes the DLM 600W Series easy to use. Voltage and current can be set from individual 10-turn potentiometer knobs. Control push buttons include power on, output on, local/remote, voltage/current preview and overvoltage protection preview. Set-point or actual voltage/ current values can be viewed on two 3.5 digit LED displays. With an easy to use Web browser interface, and designed for LXI compliance, the DLM with Ethernet makes system integration simple, fast and easy. Supplies can be connected in series or parallel. All models automatically accept any standard single phase input without manual set up.